At the time of the interview David was performing as Bobby in Dreamboats and Petticoats at Wyndham’s Theatre in London’s West End. Bill Kenwright and Laurie Mansfield, together with Universal Music present Dreamboats and Petticoats. The musical is written by Marks and Gran, the legendary team behind TV classic comedies such as Goodnight Sweetheart, Birds Of A Feather, and Shine On Harvey Moon. The show will give you one of the most enjoyable times of your life, taking you back in time to when each passing week brought another classic track. Featuring songs from the mega-talented Roy Orbison, Eddie Cochran, Billy Fury, The Shadows, Chuck Berry and many more famous singers. David recently took time out to answer some questions about himself and the show. Can you tell us about your character Bobby, and how he fits into the storyline? Bobby is the hopeless romantic lead of the show. He’s a 17 year-old geek with a passion for songwriting and an ability to fall in love at the drop of a hat! He craves the Rock N Roll lifestyle but somehow always winds up getting it all wrong and making a fool out of himself. Poor guy! Which characteristics of Bobby can you relate to as being similar to yourself? Hahaha… all of them! When I was at school I was always the one spending my lunchtimes in the music room writing songs instead of kicking a football around, and I’ve always been useless at falling for the right people! I’d like to think that I am a little bit cooler than Bobby now that I’m older, but then again I’m still a geeky kid at heart! 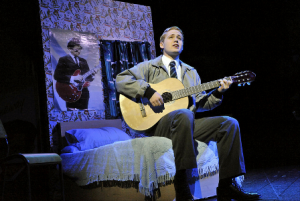 The storyline of Dreamboats and Petticoats includes songwriting, auditioning, competitions and of course performing. How does this all compare to your own career? As I said before, a lot of the journey that my character takes in the show is mirrored in my own life. When I was 17 years old I was dragging my family around to open mic nights and gigs as I tried out my own material. I suppose the only difference really is that I have always had a determination to make something of my music, whereas the character of Bobby is much less confident. I would say that although the storyline does include all of those elements, the real focus of the show is on the innocence of youth in the 60s… falling in love, breaking hearts, living life to the lyrics of a Roy Orbison song! And I’m sure everyone has had a bit of that in their own lives! What are your three favorite songs from the show? 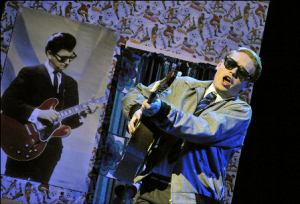 1) Runaround Sue – This is definitely my favourite because it’s the first time in the show I get to be badass and act like a Rock N Roll Star… knee slides, guitar jumps, vocal growls… the lot! 2) Let it be Me – Such a beautiful song by the Everly Brothers, and it’s the climax of Bobby’s journey towards finding the girl of his dreams. I always look forward to singing that one every night. 3) Shop Around – I don’t actually sing this one, but I get to have it sung to me every night by my Dad in the show, and it’s a great song with a great beat to it! I have to be all grumpy in the scene but its really hard not to crack a smile when the song kicks in! Why should everyone go and see Dreamboats and Petticoats? Dreamboats and Petticoats is the perfect family show. It takes you back to a time where the biggest dilemma in a teenagers’ life was whether or not they would get to sit next to the person they fancied, or whether they would get into the local band and act out their Rock N Roll dreams! Nowadays there is very little innocence left by the time we reach 17, and personally I think it’s so refreshing to see a bit of uncomplicated fun on the stage for once. The music is FANTASTIC, and all played live by the actors on stage (including two Saxophones and a Trombone! ), and I have not done a show yet where the entire audience hasn’t been on their feet dancing in the aisles for the finale. If you fancy a good laugh, a bit of a flashback to the 60s, and just an evening of good solid Rock N Roll, then Dreamboats is the show for you! Your other theatre credits include Frankie Valli and Buddy Holly in the UK Tour of Shakin’ All Over. What can you tell us about your time in that show? Shakin’ All Over was great fun! I lost count how many costume changes I had in that show, and it was great to be able to imitate such admired artists as Frankie Valli and Buddy Holly! It was funny coming into Dreamboats and Petticoats and realizing that half of the songs from Shakin’ All Over were also in it! I will never escape ‘Only the Lonely’ by Roy Orbison, and that’s fine by me! You have played the part of Roger in the musical Rent. What do you like most about that show? Rent is a very difficult one to explain. Playing Roger is something that I will never ever forget. As an actor, allowing yourself to find the extreme emotions that are demanded of a show like that is just such an incredible feeling. I lived that show every night and went to a place in myself that I didn’t know existed, and I feel so lucky to have been able to do that. The funny thing about Rent is that I think it affects the actors much more than the audience. I’ve seen the show a few times since doing it myself and I just haven’t been able to connect with the characters, even though they were acted fantastically. I cant put my finger on why, but it was an incredible show to be in none-the-less. 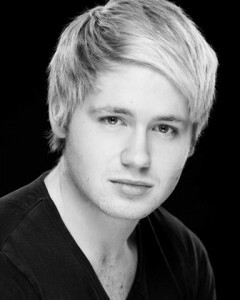 You were the first placing male in the West End’s ‘Voice of Tomorrow’ Talent Showcase. How important are these type of showcases to performers? I would recommend them to anyone. I didn’t train in Musical Theatre, I went to University and did a Drama Theory degree, so coming into London without an agent, or any experience in the industry was very daunting. The Voice of Tomorrow was ultimately the show that got me my first agent, put me in front of all the top casting directors (the judges included David Grindrod, Neil Rutherford, Mary Hammond etc. ), and gave me the experience to know exactly what I was getting myself into in this industry! It is vitally important to get your face and your voice out there so that people know who you are and start talking about you…and showcases are the perfect platform for that! What stage role did you enjoy most while at university? As I mentioned before I didn’t actually train so I never experienced the traditional ‘show at the end of a term’ thing. However, my university did have a Musical Theatre Society, and across my three years there I was lucky enough to play Tommy in The Who’s Tommy, Tobias Ragg in Sweeney Todd, and Rick Taylor in Batboy. I would say that Tommy was the most rewarding role vocally, Tobias was the best for acting and building a character, and Batboy was just a ridiculously fun show to be a part of! I love music. Whether its sitting at my piano writing a new song, recording a new version of an established song, listening to new bands, browsing youtube for unique voices etc. If ever I’m stressed I know that I’ll be able to find a song to chill me out! I also love going out and meeting up with friends, watching horror movies, and anything with a bit of adventure really!